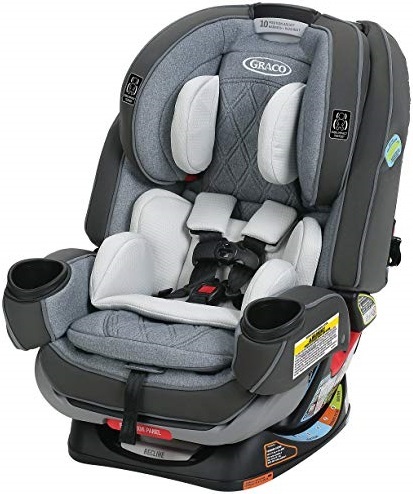 If you are looking for 2-in-1 convertible car seat and you have $100-$160 budget for that, then I’m quite sure that Graco Contender 65 and Graco Sequel 65 are two alternative choices that you consider. As two 2-in-1 convertible car seats from Graco, there are several similarities between Contender 65 and Sequel 65 that may confuse you which one to choose. In this article We will talk about comparison between Graco Contender 65 and Graco Sequel 65 to help you decide which of them is the one that you should choose. Graco Contender 65 is 2-in-1 convertible car seat that can be used in 2 different modes : rear-facing mode for 5-40 lbs infant and forward-facing with harness for 20-65 lbs toddler. Graco Contender 65 comes with Simply Safe adjust harness system. It can adjusts the headrest and harness together so that you can easily find the proper fit to make sure that you child is safe while also comfortable. 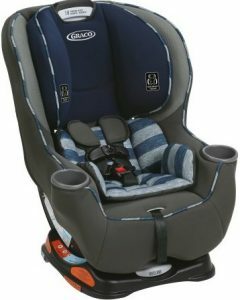 Graco Conteder 65 also comes with 5-point harness with front adjust that make it easy to get your child in and out, while keep them safe. We can also find removable head and body support that keep the baby comfortable during the trip. It’s also easy to install Graco Contender 65 since It’s already latch equipped and completed with easy-to-read level indicator for hassle-free installation. Graco Contender 65 is also completed with EPS, energy absorbing foam for effective impact energy management. The car seat pad of Graco Contender 65 is machine washable so that you shouldn’t have to worry when It gets dirty. Your child also can have easy access to their favorite drink since Graco Contender 65 is completed with integrated cup holder on the right armrest of the car seat. 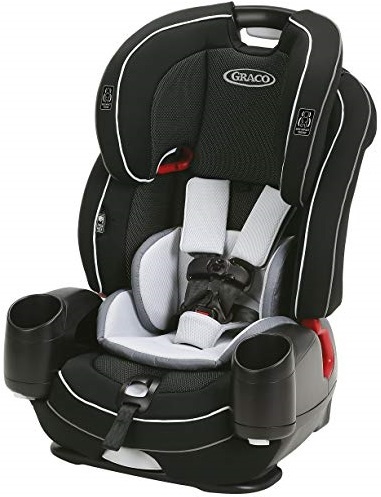 Graco Sequel 65 is another 2-in-1 convertible car seat that intended to protect 4-40 lbs infant in its rear-facing mode and 22-65 lbs toddler in its forward-facing with harness mode. Graco Sequel 65 comes with Simply Safe Adjust Harness System that can adjust the harness and headrest together with one motion. You can find 10-positions adjustable headrest that can accommodate your growing child. Graco Sequel 65 also comes with 6-positions recline that can help your growing child comfortable. This car seat comes with one-second latch attachment and easy to read level indicator that provides hassle free installation. We can also find EPS, energy absorbing foam installed in this car seat for effective impact energy management. 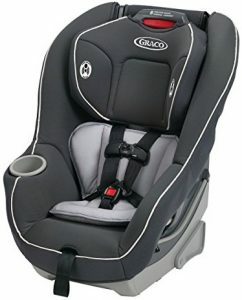 Graco Sequel 65 also comes with front adjust 5-point harness that make it easy to get your child in and out while keep them secure. Graco Sequel 65 is completed with dual integrated cup holders to give your child easy access to their favorite drinks during longer trip. We can also find that Graco Sequel 65 comes with machine washable seat pad so that you can clean it easily when It becomes dirty. It’s important for us to know the features and specs of Graco Contender 65 and Graco Sequel 65 before We talk more about the comparison between those two 2-in-1 convertible car seats. The specs and features of those two convertible car seats can be found in the table below. There are similarities and differences between Graco Contender 65 and Sequel 65 after We look at their specs and features. From those similar & different specs & features, We can talk more about their comparison. Graco Contender 65 and Sequel 65 are both introduced as 2-in-1 convertible car seat. They can be used as rear-facing infant car seat and forward-facing with harness car seat. As rear-facing infant car seat, Graco Contender 65 can be used for 5-40 lbs infant, while Sequel 65 is can be used slightly earlier from 4 lbs to 40 lbs. In the forward-facing with harness mode, Graco Contender 65 can be used for 20-65 lbs toddler, while Graco Contender 65 minimum weight for forward-facing mode is slightly higher as It can be used from 22 lbs up to 65 lbs. Both of Graco Contender 65 and Sequel 65 come with EPS energy absorbing foam for effective impact energy management. They are also side impact tested as well as engineered and crash tested to meet or exceed US standard. Graco Contender 65 and Sequel 65 come with Simply Safe Adjust Harness system that can adjust the headrest and harness with one hand. They come with multiple adjustable headrest positions. We can find 8-positions adjustable headrest positions in Graco Contender 65, while We can find 10-positions in Graco Sequel 65. Additionally, We can find 6 recline positions in Graco Sequel 65, while We can’t find any recline positions in Graco Contender 65. Both of those convertible car seats come with front adjust 5-point harness. With front adjust 5-point harness, It’s easy to get your child in and out the car seat. Installing Graco Contender 65 and Sequel 65 are also easy as They are both latch equipped and completed with easy-to-read level indicator. Both of Graco Contender 65 and Sequel 65 come with machine washable seat pad that make it easy to clean them when They become dirty. They also come with integrated cup holder that provide easy access for the children to their favorite drinks. The difference comes from the number of integrated cup holders that installed in those two car seats. Graco Contender 65 comes with single cup holder, while Graco Sequel 65 comes with dual cup holder. Graco Sequel 65 is positioned as the higher model than Graco Contender 65 as It comes with recline positions, more adjustable headrest positions and more cup holders. But how much is their price difference? To find out the latest price difference of Graco Contender 65 and Sequel 65, it’s recommended to check their price before we can find their latest price difference. Which is More Suitable for Your Kid? Share the post "Graco Contender 65 vs Sequel 65 Comparison"